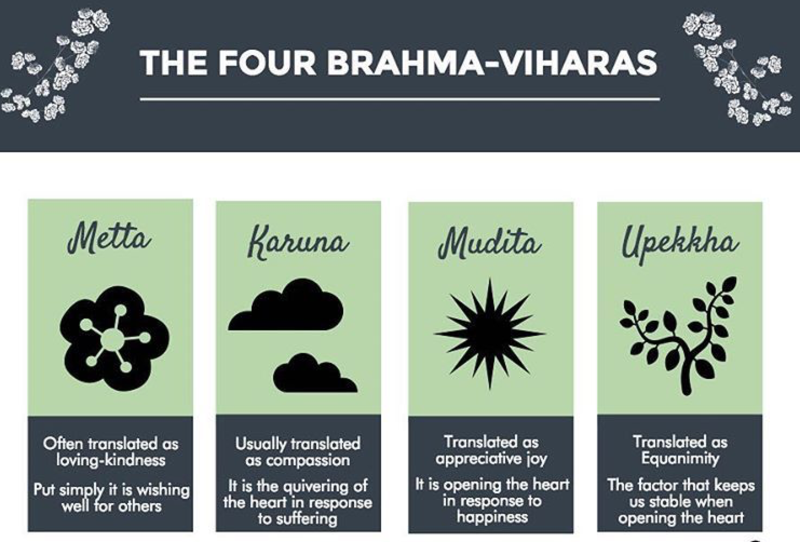 IMCC teachers are presenting a ten-part series on Tuesday nights focusing on active engagement with the Brahma Viharas. Lovingkindness—A tender regard for all. A wish for true happiness for ourselves and others. Compassion—The natural response of lovingkindness when it encounters suffering in others or in ourselves (self-compassion). Sympathetic joy—The natural response of lovingkindness when it encounters happiness in others or ourselves. Equanimity—Even-mindedness. Not to be confused with indifference or apathy. A sensitive acceptance of the constant changes in life, including acceptance of suffering that is beyond our ability to alter. Ours is a culture of violence. We are fed it daily in so many ways, blatant and subtle, that we may to some degree normalize it, even as we know it to be totally unacceptable. In this context, practicing the Brahma Viharas is a radical act, one that requires perseverance and courage. In practice, we work to express the heart qualities in our personal relationships as well as through the grit of social action.